In the early eighties, while working in the Projects Management Administration of the Cuban Ministry for Construction (MICONS), I was invited to a lecture by Mexican engineer Heberto Castillo in the premises of the Transportation Projects Enterprise (EPOT). I knew about Castillo because of his involvement in Mexican politics, a subject I had followed with a special interest since my stay in that country in late 1958. I knew him as a fighter who had always opposed social injustice and the widespread corruption present in Mexican politics, attitude that sometimes even led him to jail. Before knowing the reason for such a meeting, the opportunity to meet someone I so much admired filled me with joy. The lecture was focused on explaining a structural system whose patent Heberto intended to donate to Cuba. It was a structural system for large spans he had named Tridilosa (meaning 3D-Slab). This is a mixed tridimensional structural system, in which the combination of work between a tridimensional steel structure and a flat concrete slab that is integrated into it as keystone, working mainly in compression at the top. This slab, about 5 cm thick, besides serving as the compression resistant element also serves as the floor, thus adding the virtues and benefits of both systems. It reduces, in the case of the concrete slab, the inert material and its weight; in the case of the steel structure it replaces steel as horizontal compression resistant material by concrete. This system has been used in more than 200 bridges in Mexico, in skyscrapers as the World Trade Center and the Chapultepec Tower in Mexico City. Today there are almost one million square meters built with Heberto Castillo's invention in Mexico. The intention was to use this system to build bridges, something which would mean considerable savings in materials and equipment. As a first experience, using this system was proposed for the construction of pedestrian crossings in Havana. The structural design of the bridge's deck was conducted by the civil engineers at EPOT. A solution for the design of supports and access stairs was pending. It should take into account the characteristics of the space constraints for each possible location. This task was entrusted to me. Ultimately two projects were prepared, one intended for providing access to the Naval Hospital from the East Havana neighborhood, crossing the Vía Monumental expressway. The other in Marianao, for the pedestrian crossing of 25th Avenue at the corner of 29J Street. There was talk about the many kilometers of Tridilosa bridges to be built on different roads, in which net savings of millions would be obtained. The two crosswalks designed were built. They still provide services to Havana's population. Of the others, nothing more has been heard. May these two modest constructions serve these as a tribute to the Teacher, to the researcher, to the activist, to Heberto Castillo. Heberto Castillo's photograph is from the blog of Sergio Romero. 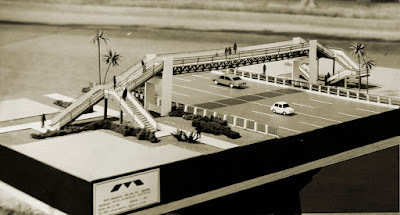 Study model for the Pedestrian Bridge design. Pedestrian Bridge over the Vía Monumental, seen from Habana del Este. View of the bridge's structure. View from the Naval Hospital side. Photos: R. Togores archives. Pedestrian Bridge over 25th Avenue, Marianao. Photos: CalderonRolando.(Panoramio). I was at Heberto's lectures, I went with Engineer Quintana, Irina Nedelcu's husband, who by then was calculating the space structures that we were designing for the Expo-Cuba project. Heberto, being an engineer, came up with the Tridilosa which was a Space Frame Structure that was not only self-supporting and subject to be "covered" with x solutions, but one that would include a flat-slab which would be able to assimilate compression stresses like the compression head of a conventional flexo-compression beam, but saving the wide spans of a space frame that is usually not calculated as a flexo-compression beam. In those days we were studying the know-how of the Tridilosa and found it had multiple applications, including airports, hangars, factories, covers for sports centers, theaters, etc. Like everything in Cuba goes, nothing happened and I have a certain idea that [Engineer M.] Isoba had something to do with nothing happening. The novelty of the Tridilosa, was that it combined two structural philosophies, endowing each other of new capabilities for which -originally and independently- they were not intended; taking advantage of concrete's compressive strength and and steel's tensile, not only gaining strength, but providing the bearing capacity for architectural and urban uses.